Classic 2nd Superman cover! Jerry Siegel story. Fred Guardineer and Bernard Baily interior art. 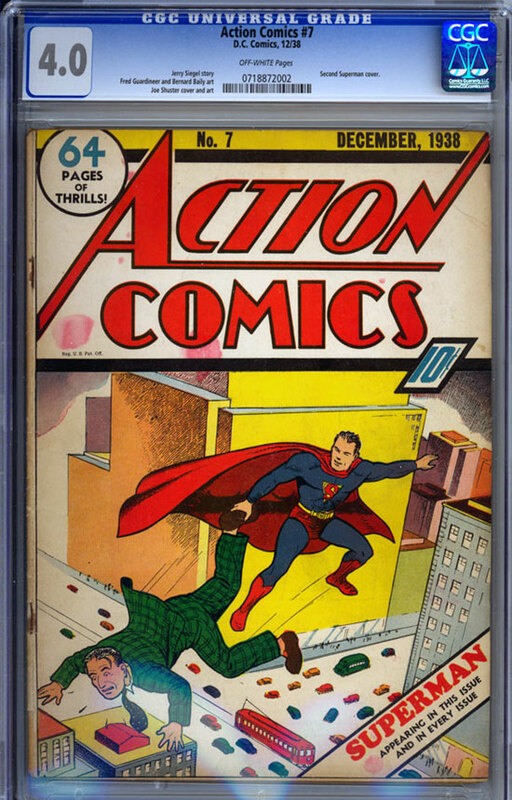 Joe Shuster cover and interior art on the Superman story. A really nice looking low grade copy that doesn't exhibit any major flaws. There is a chip off the bottom of the spine that is just over an inch long, some pronounced wear along the spine, rust on the staples and a couple pink stains near the logo on front cover, each about the size of a dime. The cover colors are very bold and fresh in appearance and the whites are white. There are no corner chips or tears (other than the bottom of spine already mentioned) on either cover. There is a 3/4 inch line just to the right of the "N" in "Action" on the front cover. This is either a clean edge tear or a crease. It's hard to tell which. My guess is that it is a very fine, clean tear that is hardly noticeable. All in all, a very respectable copy of a book that rarely becomes available for purchase.